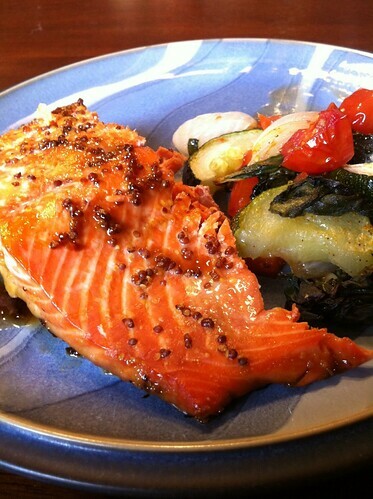 I love easy and delicious recipes and salmon really fits the bill. Evan even calls it the most delicious fish! Preheat oven to 450 degrees. Line pan with parchment paper & spray with cooking spray. Lay salmon skin side down. Pour half the glaze on the salmon. Place in oven. Cook for 5 minutes & then pour the remaining glaze on the salmon. Cook until salmon is cooked through and flakes (about 5-10 more minutes depending on thickness). Recipe Notes: I chopped up bok choy, bell pepper, onions, zucchini and cherry tomatoes, drizzled with olive oil & baked them alongside the salmon. I poured a bit of the glaze over them as well. Holy they were good! I think you could use any veggies. Just make sure to cut the pieces about the same size so it cooks evenly. That’s my desert island food…you know, the food that you would choose if you had to choose just one? And with maple? I die. It’s so yummy. I like a sweet glaze on salmon. I’m not sure why but it is one of my absolute faves. Mmm…that looks good, I’m going to have to try it. We all love salmon here! Haha! I am glad I’m finally getting back to cooking. I seem to have taken the summer off.